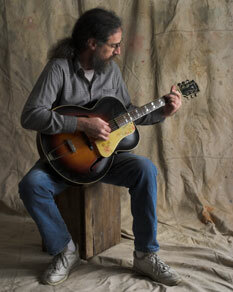 On his new CD Root and Branch (Wave Chair CD 777) Ted Estersohn brings it all back home---bottleneck blues and fancy fingerpicking; blues original and traditional, some heartfelt, some humorous; a little jazz and even a bluesy take on an old modal mountain tune. While most of the album reflects what one guy in a chair can do on a stage, there is an occasional overdubbed mandolin, tenor banjo, or mandocello. On the St. James Infirmary, they all come together as The Greater South Philadelphia String Quartet Glee and Perloo Society. At a time when every kid with a guitar wanted to be either Bob Dylan or a Beatle. Ted Estersohn was busy hanging with Mississippi John Hurt, Doc Watson, and Jerry Ricks. Philadelphia during the Great Folk Scare of the 60’s was fertile ground for such pursuits and the blues muse ran deep with Ted. Before the age of 21, he had played with such blues greats as Son House, Bonnie Raitt, Mississippi Fred McDowell, Mance Lipscomb, and John Jackson. Over the decades a wide-ranging musical curiosity has taken Ted to ragtime guitar, klezmer and Cajun, New Orleans, Russian, Italian, classical, swing, and jazz; picking up some mandolin, banjo, and fiddle along the way. Yet somehow, the blues has stayed closest to his heart, a certain rhythmic touch, a sliding and snapping of strings, a habit of viewing the world in twelve bars that insinuates itself even into more abstract moods laden with counterpoint and modern harmony. The study of music is full of rules that are meant to be broken. On the other hand here are some keepers. Are you bugged at Jeopardy! because they seldom quiz good music, and even when they do it's too tame and mainstream? Audio, Len Perskie, Ted Estersohn, Michael Tearson, Frank Fitzmaurice; CD mastering, John Reynolds; Web design, Ted Estersohn.